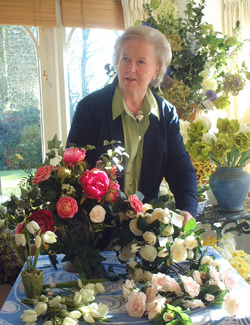 Over the last 20 years Pene Dene has created beautiful arrangements using the fabulous faux flowers which she has found on her travels round the world. Tiny snowdrops sitting in pretty glass vases, tall phalaenopsis orchids, waxy white and as glorious as the real thing, are planted in superb blue and white Chinese vases, roses blushed in softest pink are the perfect flower for a summer dining table – the list of blooms is endless but all have one thing in common and that is the care with which they have been selected by master florist Pene Dene. Years as an interior decorator taught Pene the joy that her clients felt when their house was filled with flowers and her talent as a horticulturalist has enabled her to choose the finest flowers and arrange them with skill and creativity.